What does it take to close a deal? Mediation is all about making a deal. Usually some time in the late morning or early afternoon offers and counter offers start to flow and the Mediator may find themselves caught in rooms where “last and final offer” and “nothing more to give” are phrases that are bandied about zealously. A good Mediator will exercise caution in disclosing such views to the other party until it would seem that is genuinely the case. To do so earlier risks creating an artificial impasse. So what do you need for parties in conflict to reach an agreement? Convince the other party you are at your bottom line. If a deal is not forthcoming, at least one of these components will be missing. A good Mediator will identify what is lacking in each room and help it to be found. How will they do that? Logical needs is usually the area advisers find easiest to deal with, being trained to think logically. A clear analysis of what a worst day, best day and most likely day in court is likely to yield and the probability of each is a good starting point. An adviser should remind their client that even if the probability of the worst outcome is only say 20%, that means if a one day trial were to be run over 5 days with different judges, one of those 5 hearings would result in the worst outcome. Could their client live with that? If the answer is “no”, it is probably not a risk worth taking. So negotiations should continue or the deal on offer be accepted if a better one cannot be obtained. In this world of increasing “competimates” (where competitors are also trading partners) and decreasing choice of companies with whom to do business (as mergers abound) it may be logical to restore a relationship and continue trading as frankly there is scant choice of other alternatives. This one is a “biggie”. While the deal on offer may make good business sense, emotionally one party may no longer trust the other or they may harbour so much resentment they feel unable to make a deal. Family business disputes are often the worst for this. As a Mediator said to my client recently when I was their mediation advocate: “you are not going to make a deal unless somehow you get rid of your anger”. Easier said than done. On the mediation day this can be helped by an apology, frank discussion between the parties, an “agreement to disagree” on certain issues, “venting” in a private caucus with the Mediator and good summarising and reflecting back by the Mediator, or even something as simple as taking a walk. People will always wonder how far they can push the other party and whether there is something more they can gain by continuing to negotiate. At a mediation the aim is to find a deal that is “satisfactory to all”. You will almost never get your best outcome at a mediation. That must be saved as a possible but unlikely lucky dip result of a court hearing, with all the high emotional and financial stakes that accompany it. The Mediator will gain a better understanding of each party’s interests and needs if time is spent exploring these matters early on in the mediation. It may be the parties will authorise the Mediator to disclose such needs and interests to the other. Moving to bargaining too quickly prevents a sound understanding being developed of “what might work” for each party. The best way to convince someone you are at your bottom line is to look at them straight in the eye and say so. This is why sometimes, when parties are reaching a deal that encompasses continuing to trade, I will suggest a joint meeting between the two key decision makers with myself so that exactly this can happen. Regretfully this means the advisers who may well have sweated blood in progressing their client’s litigation for many months are not present at the closing moment. But isn’t that a small price to pay for peace and a satisfied client? At the end of the day if a deal is “good enough” for both parties at a mediation that is a successful outcome. Like so many things in life, striving for perfection or the maximum possible comes at a price of possibly not reaching the finishing line, and not being able to move on to the next challenge. As has been wisely said: “The past cannot be changed. The future is yet in your power”. It will be interesting to see how the UK’s Brexit negotiations continue, as I understand partly masterminded by another negotiation “guru”, Bill Ury (of “Getting to Yes” and “Getting Past No” fame, my two favourite generic negotiation texts). Which of the three components will be hardest to satisfy for each member of the EU, and most particularly the UK? Anglo German approaches to Mediation - why so different? Top Tips on Mediation - What is the Price of Peace? 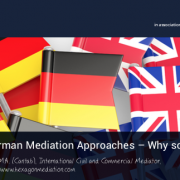 Anglo German approaches to Mediation – why so different?